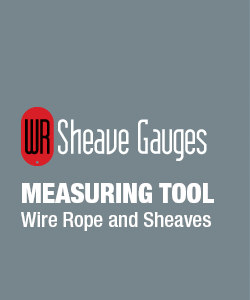 API RP-9B +2.5% - Wire Rope and Sheave Gauge which includes a measuring tool for wire rope and sheaves. An excellent promotional item for wire rope cable, sling and rigging equipment for manufacturers and distributors. Under 1000 gauges; stock plastic colours are Black, White or Hunter Green. Sizes: 3/8", 7/16", 1/2", 9/16", 5/8", 11/16", 3/4", 13/16", 7/8", 15/16", 1", 1 1/8", 1 1/4", 1 3/8", 1 1/2"